"My ancestors fought for me to have a way of life to live for. So I honor them by holding on to our language and tradition as much as possible." We spoke with Coloradas via phone and email in June and July 2015. Coloradas is a 21 year-old Mescalero Apache of Chiricahua descent who lives on the Mescalero Apache Reservation in New Mexico. Coloradas has had many opportunities to travel around the country, from Anchorage, Alaska to Washington, D.C., to speak and advocate for his community and the ways in which incorporating Native American tradition back into everyday life can help prevent suicide on his reservation. He plans to study political science and historical preservation in college to further advance his advocacy work. How do you refer to yourself? What does being Chiricahua Apache mean to you? I refer to myself in Apache. Shi Coloradas Mangas Huuntsye, Shi Chi’hen ashti! That translates to “My name is Coloradas Mangas. I am Chiricahua Apache of the Red Paint People.” Being Apache is everything. My ancestors fought for me to have a way of life to live for. So I honor them by holding on to our language and tradition as much as possible. What inspired you to become a suicide prevention advocate? Many things, but my personal experiences in particular. When I was in high school, several of my close family and friends took their own lives. I was there to help my friends mourn and move on, but during that time I, myself, couldn’t mourn. I was what several of my high school teachers and mentors called “a rock” for many people; A rock for them to help rebuild their lives. During this time, a family friend involved with the Mescalero Apache Tribe asked if I wanted to go to Washington D.C. to speak on behalf of my people here in Mescalero, New Mexico, but also Native American Indians across the country. I spoke to the United States Senate Committee on Indian Affairs, with people from other tribes as well, about suicide prevention in Indian country. 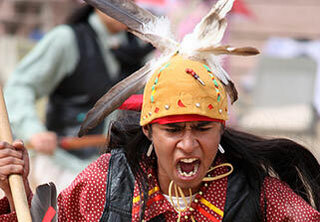 How can integrating Native American tradition and culture back into your community help youth? First, our culture is mainly based around language. By having traditional language within the home setting, it helps the youth and young children understand what our songs and dances mean, allowing them to take part whenever community ceremonies are taking place. Most dances you can dance if you don’t know the language. But it’s better to know the language so you can understand what the song is about and understand the blessing of the song, because every dance that Native American people do is a blessing dance. Second, Native American people are close to the people we live with in our homes. When you come from a Native American family, you live with a lot of people. The family is supposed to be all together and be real close, and talk and have good communication. But nowadays most youth don’t talk to their parents as much as they should. This can cause emotional distress on the children and parents if they think little communication is because of a lack of love for each other. And that can cause the child to turn to alcohol and drugs, suicide, or both; and the parents to do the same. But drugs and alcohol only make things worse. What types of resources does your reservation have for youth? There are a few resources that personally I say are excellent, such as the language program1 to help bring back the language, and the Mescalero Systems of Care that focuses on the youth and parents. It provides many things: mentoring, horse therapy, travel experiences to historic Apache monuments, and also youth group meetings. There are many opportunities available. The horse therapy involves learning how to take care of a horse because Native American people have always been connected to horses. We find spiritual and emotional healing through riding and taking care of horses. Nowadays it’s hard to take care of a horse on your own so most families don’t have a horse but the therapy program reconnects Native people to horses. 1 The Mescalero Apache Tribe and a New Mexico State University professor are constructing an electronic dictionary and grammar rules, and producing hundreds of hours of audio and video recordings of the Mescalero, Chiricahua and Lipan Apache languages to help bring them back into use and be understood. Why should youth take advantage of the opportunities available to them on the reservation? The reservation can provide the facilities but if the youth are not going to take advantage of services, then why should the tribal government provide them? The youth need to get out there and take part in their community and stand up for themselves and say, “Hey this is what we need and we’re willing to change if you guys are willing to make the commitment to getting us opportunities.” The youth need to understand that the tribal government shouldn’t have to pay all this money if the youth are not making the commitment to take advantage of the opportunities available to them. I speak to youth in school and tell them they need to take part in their community and understand that the tribe is creating these opportunities for them. They also need to get out there and take part in the ever changing world while still holding onto their traditions and cultures. I encourage youth to take part in the politics taking place on and off the reservation. I’ll be a freshman in college this fall. I plan to have a career as a museum curator, preserving culture and tradition. I also will continue advocacy work with youth.